Diamond certificates from independent organizations such as the Gemological Institute of America (GIA) provide a diamond grading report, that gives you valuable information about the 4 C's that were taken into consideration when the diamond was priced. It's important that you use an outside source for diamond certificates, instead of the jeweler who is selling the diamond you are interested in, because the jeweler wants to make money on the sale of the diamonds, the certificates may be slightly biased and you could be paying more than the market value of the diamond. When you go to a jewelry store or consider making a purchase from an online retailer, the jewelry that has diamond certificates tends to sell for several hundred dollars more than diamonds that are graded the same that are without certificates. This is because the jeweler recognizes that they typically grade their diamonds one level better than an independent grading organization, like the Gemological Institute of America. The GIA is more conservative when grading diamonds because they do not gain anything from diamond sales. Diamonds are valued according to their quality based on a grading system that makes use of the 4 C's. You should receive diamond certificates (also called grading reports) from independent companies rather than a jeweler, to insure that you are getting an unbiased reporting of the value of the diamond. Otherwise, you could be paying much more for your diamond than what the diamond is actually worth. Diamonds are not the same kind of investment as buying stocks and bonds, but having diamond certificates gives you a better investment than just having the diamond. Diamond certificates make it easier to sell a diamond in the future, because you have documentation of how much the diamond is worth and why it was valued that amount. In fact, if you attempt to sell diamonds without having diamond certificates, most dealers will not buy from you and you would end up having a certificate drawn up anyway, so you may as well have a certificate grading report created at the time of purchase, for your current protection as well as future possibilities for selling. Many people hesitate to bring their jewelry into the jeweler's when they're in need of repair services or cleaning. It makes people wonder how they'll know for sure that they've received the same diamond back that they brought in. 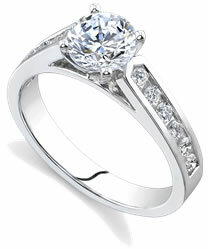 It is an extremely rare occurrence for a jeweler to purposely switch diamonds, however it could happen unintentionally. Diamond certificates act as an additional security measure in this case. They are like the fingerprints stored in police databases; they contain all the data needed to match the person to the fingerprints, and diamond certificates have enough information on the diamond to match the diamond with the certificate and the owner.